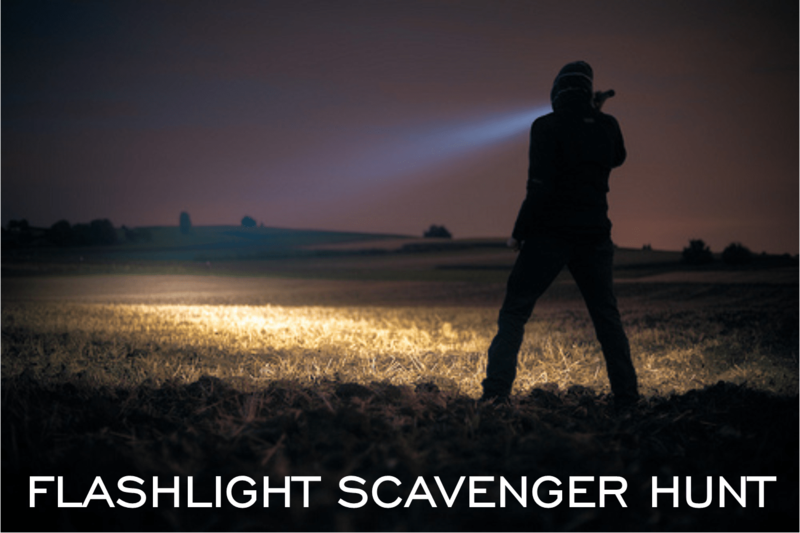 Flashlight Scavenger Hunt. Sticking with our Flashlight theme this week, we are sharing another classic with a twist. Before you begin playing, make sure to turn out or cover all the lights in the area you will be playing in. If you are outside, you will just need to make sure it’s dark enough that they will need flashlights. You will also need to either compile a list of items that participants must find. You can use existing items (though they will need to be put back in place) or place random items throughout the building. Each item will be assigned a point value. Point values should range from low to high, based on ease of finding, amount placed on the course. For example, if you have 50 pennies on the course, they won’t be worth too many points, whereas, the one Snicker’s Bar you placed in a tough spot to find will be worth much more. Lastly, make sure that you have lots of items for the group to find. I would recommend at least 25 items per person, which should probably put your list at around 50 items total if some of them are only a few. It sounds like a lot more than it really is, since you can grab things like paper-clips or post-it notes that everyone can find. 1. Have plenty of extra flashlights & batteries. You can by cheap flashlights at the Dollar Store. You can also find some great items for the hunt there as well. 2. If inside, play in a space that has multiple rooms to divide up the group. If outside, make sure to mark off clear boundaries. 3. Award the winner(s) a gift card for their efforts.